Classical Academic Press, $12.95 By Sarah Mackenzie Also available as an AudioBook Also available is a Journal classicalacademicpress.com “The Greek word for leisure (scholé) is the origin of Latin scola, English school. The name for the institutions of education and learning mean “leisure.” – Josef Pieper By Emerson Sandow It is safe to say that real homeschooling families – not those who simply seek free materials and teacher guidance – but those who actually want to teach/raise their own children, their own way, do so out of some inner sense that they know the appropriate path for the family. These people are not part of the great herd of humanity, but know the veracity and validity of individual family-centered, homeschooling somehow. Of course, with this knowing comes the opportunity for its opposite – doubt, self-doubt – even panic at times, that the teaching parent is falling short of what the beloved child deserves. As a side note, unfortunately, most of the teaching in homeschooling falls to the women. Men are too often intellectually invisible. But no matter if one or both parent shoulders the major burden, homeschooling is not typically carefree and light – but it does feel right. But if one pursues the meaning of scholé it denotes the sort of leisurely strolling Q-and-A that Plato conducted; seeking the Truth and Reality that cast their shadows into our physical world. Leisurely, even meditative study of things of importance. In her enlightening book, Sarah Mackenzie, homeschooling mom of six, provides delves into the practice of scholé as it applies to homeschooling one’s child(ren). As you may ascertain, she does not suggest having the placid robotic teaching demeanor of a Stepford Wife, but rather teaching with mindfulness that scholé is the goal. Allowing one’s child to experience the enrichment of learning as a natural lifestyle – mental breathing, if you will. We notice that when our children are in the grocery store or some social event, they are soaking up information and knowledge all of the time. Homeschooled children are typically not taught to shut their brains off when the bell rings at 3:30. Rather, they are always awake to new things. To me, this is also part of the definition of scholé. Sarah Mackenzie can help you find your way to scholé and peace of mind, too, having the deep sense within that you are following The Way in raising your children. 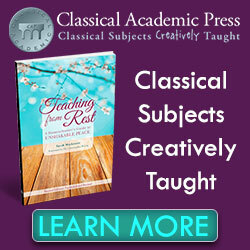 Please note that there are companion Teaching From Rest products available on the Classical Academic Press website as well. Read it and rest! E.S.